For three years Barack Obama was the director of Developing Communities Project, an institutionally based community organization on Chicago's far south side. He has also been a consultant and instructor for the Gamaliel Foundation, an organizing institute working throughout the Midwest. "Why Organize? Problems and Promise in the Inner City" was first published in the August/ September 1988 Illinois Issues [published by then-Sangamon State University, which is now the University of Illinois at Springfield]. Over the past five years, I've often had a difficult time explaining my profession to folks. Typical is a remark a public school administrative aide made to me one bleak January morning, while I waited to deliver some flyers to a group of confused and angry parents who had discovered the presence of asbestos in their school. "Listen, Obama," she began. "You're a bright young man, Obama. You went to college, didn't you?" "I just cannot understand why a bright young man like you would go to college, get that degree and become a community organizer." " 'Cause the pay is low, the hours is long, and don't nobody appreciate you." She shook her head in puzzlement as she wandered back to attend to her duties. I've thought back on that conversation more than once during the time I've organized with the Developing Communities Project, based in Chicago's far south side. Unfortunately, the answers that come to mind haven't been as simple as her question. Probably the shortest one is this: It needs to be done, and not enough folks are doing it. The debate as to how black and other dispossessed people can forward their lot in America is not new. From W.E.B. DuBois to Booker T. Washington to Marcus Garvey to Malcolm X to Martin Luther King, this internal debate has raged between integration and nationalism, between accommodation and militancy, between sit-down strikes and boardroom negotiations. The lines between these strategies have never been simply drawn, and the most successful black leadership has recognized the need to bridge these seemingly divergent approaches. During the early years of the Civil Rights movement, many of these issues became submerged in the face of the clear oppression of segregation. The debate was no longer whether to protest, but how militant must that protest be to win full citizenship for blacks. Twenty years later, the tensions between strategies have reemerged, in part due to the recognition that for all the accomplishments of the 1960s, the majority of blacks continue to suffer from second-class citizenship. Related to this are the failures real, perceived and fabricated of the Great Society programs initiated by Lyndon Johnson. Facing these realities, at least three major strands of earlier movements are apparent. First, and most publicized, has been the surge of political empowerment around the country. Harold Washington and Jesse Jackson are but two striking examples of how the energy and passion of the Civil Rights movement have been channeled into bids for more traditional political power. Second, there has been a resurgence in attempts to foster economic development in the black community, whether through local entrepreneurial efforts, increased hiring of black contractors and corporate managers, or Buy Black campaigns. Third, and perhaps least publicized, has been grass-roots community organizing, which builds on indigenous leadership and direct action. Proponents of electoral politics and economic development strategies can point to substantial accomplishments in the past 10 years. An increase in the number of black public officials offers at least the hope that government will be more responsive to inner-city constituents. Economic development programs can provide structural improvements and jobs to blighted communities. In my view, however, neither approach offers lasting hope of real change for the inner city unless undergirded by a systematic approach to community organization. This is because the issues of the inner city are more complex and deeply rooted than ever before. Blatant discrimination has been replaced by institutional racism; problems like teen pregnancy, gang involvement and drug abuse cannot be solved by money alone. At the same time, as Professor William Julius Wilson of the University of Chicago has pointed out, the inner city's economy and its government support have declined, and middle-class blacks are leaving the neighborhoods they once helped to sustain. Neither electoral politics nor a strategy of economic self-help and internal development can by themselves respond to these new challenges. The election of Harold Washington in Chicago or of Richard Hatcher in Gary were not enough to bring jobs to inner-city neighborhoods or cut a 50 percent drop-out rate in the schools, although they did achieve an important symbolic effect. In fact, much-needed black achievement in prominent city positions has put us in the awkward position of administering underfunded systems neither equipped nor eager to address the needs of the urban poor and being forced to compromise their interests to more powerful demands from other sectors. Self-help strategies show similar limitations. Although both laudable and necessary, they too often ignore the fact that without a stable community, a well-educated population, an adequate infrastructure and an informed and employed market, neither new nor well-established companies will be willing to base themselves in the inner city and still compete in the international marketplace. Moreover, such approaches can and have become thinly veiled excuses for cutting back on social programs, which are anathema to a conservative agenda. In theory, community organizing provides a way to merge various strategies for neighborhood empowerment. Organizing begins with the premise that (1) the problems facing inner-city communities do not result from a lack of effective solutions, but from a lack of power to implement these solutions; (2) that the only way for communities to build long-term power is by organizing people and money around a common vision; and (3) that a viable organization can only be achieved if a broadly based indigenous leadership and not one or two charismatic leaders can knit together the diverse interests of their local institutions. This means bringing together churches, block clubs, parent groups and any other institutions in a given community to pay dues, hire organizers, conduct research, develop leadership, hold rallies and education campaigns, and begin drawing up plans on a whole range of issues jobs, education, crime, etc. Once such a vehicle is formed, it holds the power to make politicians, agencies and corporations more responsive to community needs. Equally important, it enables people to break their crippling isolation from each other, to reshape their mutual values and expectations and rediscover the possibilities of acting collaboratively the prerequisites of any successful self-help initiative. By using this approach, the Developing Communities Project and other organizations in Chicago's inner city have achieved some impressive results. Schools have been made more accountable-Job training programs have been established; housing has been renovated and built; city services have been provided; parks have been refurbished; and crime and drug problems have been curtailed. Additionally, plain folk have been able to access the levers of power, and a sophisticated pool of local civic leadership has been developed. But organizing the black community faces enormous problems as well. One problem is the not entirely undeserved skepticism organizers face in many communities. To a large degree, Chicago was the birthplace of community organizing, and the urban landscape is littered with the skeletons of previous efforts. Many of the best-intentioned members of the community have bitter memories of such failures and are reluctant to muster up renewed faith in the process. A related problem involves the aforementioned exodus from the inner city of financial resources, institutions, role models and jobs. Even in areas that have not been completely devastated, most households now stay afloat with two incomes. Traditionally, community organizing has drawn support from women, who due to tradition and social discrimination had the time and the inclination to participate in what remains an essentially voluntary activity. Today the majority of women in the black community work full time, many are the sole parent, and all have to split themselves between work, raising children, running a household and maintaining some semblance of a personal life all of which makes voluntary activities lower on the priority list. Additionally, the slow exodus of the black middle class into the suburbs means that people shop in one neighborhood, work in another, send their child to a school across town and go to church someplace other than the place where they live. Such geographical dispersion creates real problems in building a sense of investment and common purpose in any particular neighborhood. Finally community organizations and organizers are hampered by their own dogmas about the style and substance of organizing. Most still practice what Professor John McKnight of Northwestern University calls a "consumer advocacy" approach, with a focus on wrestling services and resources from the outside powers that be. Few are thinking of harnessing the internal productive capacities, both in terms of money and people, that already exist in communities. Our thinking about media and public relations is equally stunted when compared to the high-powered direct mail and video approaches successfully used by conservative organizations like the Moral Majority. Most importantly, low salaries, the lack of quality training and ill-defined possibilities for advancement discourage the most talented young blacks from viewing organizing as a legitimate career option. As long as our best and brightest youth see more opportunity in climbing the corporate ladder-than in building the communities from which they came, organizing will remain decidedly handicapped. None of these problems is insurmountable. In Chicago, the Developing Communities Project and other community organizations have pooled resources to form cooperative think tanks like the Gamaliel Foundation. These provide both a formal setting where experienced organizers can rework old models to fit new realities and a healthy environment for the recruitment and training of new organizers. At the same time the leadership vacuum and disillusionment following the death of Harold Washington have made both the media and people in the neighborhoods more responsive to the new approaches community organizing can provide. Nowhere is the promise of organizing more apparent than in the traditional black churches. Possessing tremendous financial resources, membership and most importantly values and biblical traditions that call for empowerment and liberation, the black church is clearly a slumbering giant in the political and economic landscape of cities like Chicago. A fierce independence among black pastors and a preference for more traditional approaches to social involvement (supporting candidates for office, providing shelters for the homeless) have prevented the black church from bringing its full weight to bear on the political, social and economic arenas of the city. Over the past few years, however, more and more young and forward-thinking pastors have begun to look at community organizations such as the Developing Communities Project in the far south side and GREAT in the Grand Boulevard area as a powerful tool for living the social gospel, one which can educate and empower entire congregations and not just serve as a platform for a few prophetic leaders. Should a mere 50 prominent black churches, out of the thousands that exist in cities like Chicago, decide to collaborate with a trained organizing staff, enormous positive changes could be wrought in the education, housing, employment and spirit of inner-city black communities, changes that would send powerful ripples throughout the city. In the meantime, organizers will continue to build on local successes, learn from their numerous failures and recruit and train their small but growing core of leadership mothers on welfare, postal workers, CTA drivers and school teachers, all of whom have a vision and memories of what communities can be. In fact, the answer to the original question why organize resides in these people. In helping a group of housewives sit across the negotiating table with the mayor of America's third largest city and hold their own, or a retired steelworker stand before a TV camera and give voice to the dreams he has for his grandchild's future, one discovers the most significant and satisfying contribution organizing can make. In return, organizing teaches as nothing else does the beauty and strength of everyday people. Through the songs of the church and the talk on the stoops, through the hundreds of individual stories of coming up from the South and finding any job that would pay, of raising families on threadbare budgets, of losing some children to drugs and watching others earn degrees and land jobs their parents could never aspire to it is through these stories and songs of dashed hopes and powers of endurance, of ugliness and strife, subtlety and laughter, that organizers can shape a sense of community not only for others, but for themselves. Obama states in his Book "Dreams from my Father:" "Change won't come from the top, I would say. Change will come from a mobilized grass roots. That's what I'll do. I'll organize black folks. At the grass roots. For change." I found the below image on Obama's own website. If I hadn't been researching him I wouldn't recognize it for what it is. Arrogance or Audacity? 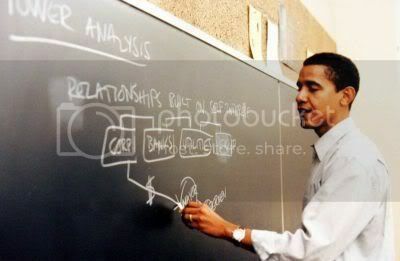 Obama Teaches the Alinsky principles of "Power Analysis" and "Relationships built on self-interest" as seen written upon this blackboard; Alinsky keywords. At the heart of the Alinsky method is the concept of "agitation"--making someone angry enough about the rotten state of his life that he agrees to take action to change it; or, as Alinsky himself described the job, to "rub raw the sores of discontent." It's not surprising that Obama made his "bitter" comment in San Francisco . He just forgot to embitter Pennsylvanians first by pinpointing the "Correct" source of pain in their lives, tearing down their egos just enough before dangling a carrot of hope that they could make things better. For this is the Alinsky way. Obama is not a post racial Candidate. His entire life he has tried to figure out how to be a black man and fit in with his white blood. His entire carrear has been focused on the black community using principles laid down by the school of Alinsky. When Obama uses the terms, "change" and "hope" they are keywords of marxist principle. In an Obama world the 'changes' he could make as a politician for blacks were more sustainable than what he could accomplish as an organizer. By 1995, he laid out his vision of the agitator-politician in an interview with the Chicago Reader: "What if a politician were to see his job as that of an organizer, as part teacher and part advocate, one who does not sell voters short but who educates them about the real choices before them? As an elected public official, for instance, I could bring church and community leaders together easier than I could as a community organizer or lawyer." Each day that I learn more about Mr. Obama, that has been concealed, I have to ask myself, just what is his 'ultimate goal' and why does this language of "CHANGE" appear everywhere in the roots of Marx and Communism vernacular? Here's a problem with an Obama 'hope' for 'change' as promise-ing, and his grass roots dreamer manifestos - His best laid Communist plans haven't worked in Chicago. Nor anywhere else in the World. I read somewhere an interview given by one of the students taught in the above class. This student said that Obama had them throwing questions at him and he practiced dodging them. It also appears that he used the classroom as a training ground for his own lessons. Nothing Alinsky said or recommended was any different from what right wing pro capitalists like the ones on this web site do. You're just angry because Alinsky was focused on the rights and liberty of the common people, and not you elitist business people. To follow what Saul Alinsky believed would be to reduce all men to the level of a stagnant lake.